Movies and Doctors, Oh My! Yesterday was a usual long Monday, starting by leaving the house at 6:00 am for my be-weekly chiropractor appointment which was SO needed. Of course that puts me behind, but my current story is going well and probably will be posted today and the one that I started yesterday I'm loving, although it will be a much longer than usual piece. I think I'm OK with that, because I love the way that it's coming together. 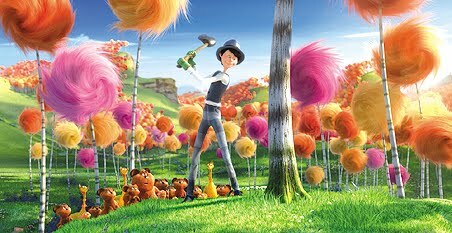 Last night, after work, I met the Chickie at the local movie theatre to see "The Lorax" in 3-D. I really could have cared less that I saw it in 3-D, but getting to the theatre in time to see the earlier show was tight. So we had a nice dinner at Chipotle and then wandered over to see Dr Seuss in 3-D.
"The Lorax" was fun, although not nearly as good as "Despicable Me". It was colorful with great characters, but very 'song and dance' with mostly very forgettable songs. 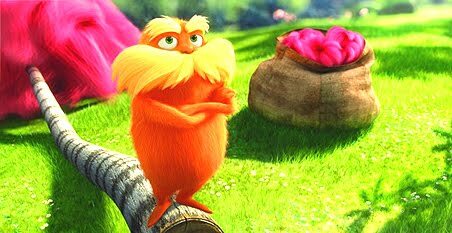 I loved the actual 'trees' that the Lorax was the spokesperson for. They were gorgeous, fluffy, and had these psychedelic trunks in horizontal stripes of grey and white that could light up. I think the best scene in the movie is when the bed is used as a white water raft. Awesome. But it doesn't do much for family values - one family is great (Betty White? Best grandma ever! ), one family seems to be absent (does the girlfriend even have a family?) and one is totally dysfunctional. It was a fun time to laugh at the movies. See this one without the 3-D (nice but not necessary) or just on RedBox. Save your pennies for "Despicable Me 2" which will be out in 2013 if we live through 12-21-2012.